The details come from a patent application continuation published by the U.S. Patent and Trademark Office on Thursday entitled "Payment Options Based on Location." Discovered by AppleInsider, the filing describes an e-wallet system that would provide users with "smart menus" based on the context of a transaction. In the application, Apple notes that even with current physical wallets, consumers generally opt for the payment option that is most convenient at the time. For example, a shopper may simply grab the credit card that is at the top of their wallet, without considering that alternative payment options could offer more benefits. Credit card companies that provide customers with rewards frequently offer bonus points during certain periods for specific types of transactions, such as restaurants or gas. A smart, connected e-wallet system from Apple could be aware of those rewards, and would recommend cards to customers based on this data. 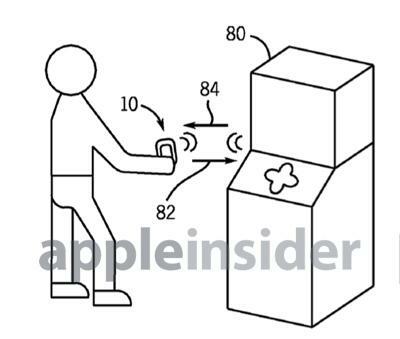 Apple's proposed system could also identify a user's location and determine what store they are at. 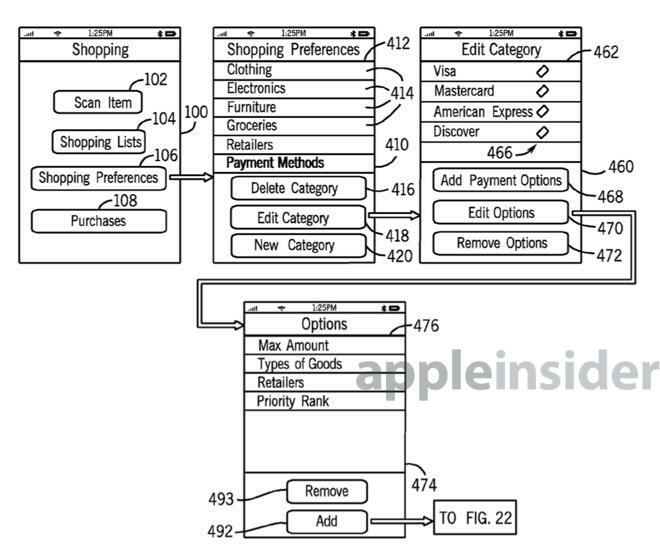 Much like Passbook already automatically displays store cards, Apple's e-wallet system could provide users with the applicable store card as part of the checkout process. The application shows a system that would allow an iPhone to manage multiple credit card accounts. With the appropriate login information, Apple could even track remaining balances on these accounts, and make contextual recommendations at checkout based on such data. The system could even allow customers to review potential financing plans when making a purchase. In one example, the user is presented with an interest rate, minimum monthly payment, and any applicable late fees or due dates. Users could also manually manage a list of stores, and modify their preferred payment method for each location. Stores could be organized in categories, making businesses easier to find and edit. Cards could even be ranked generally in order of priority. For example, a user may place their Discover card at No. 1, but in the event that a store does not accept that card, the system could then attempt to use the shopper's No. 2 card of choice, Mastercard. 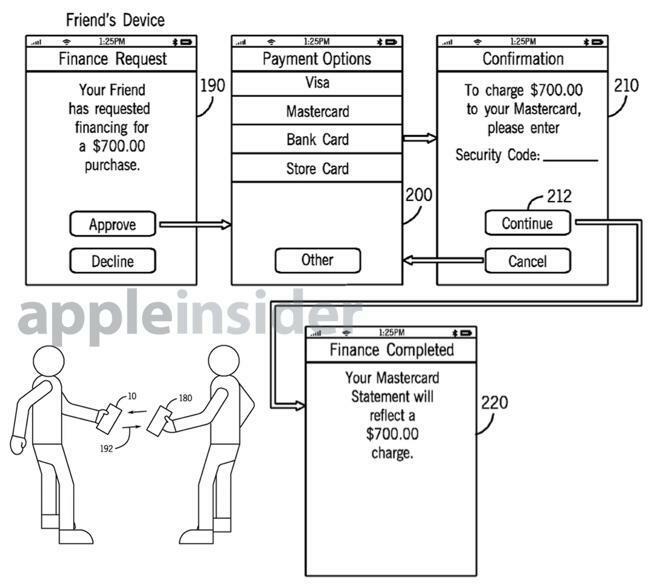 In illustrations included with the filing, Apple's e-wallet functionality is driven by a new application named "Shopping." It features an old fashioned cash register as its icon. 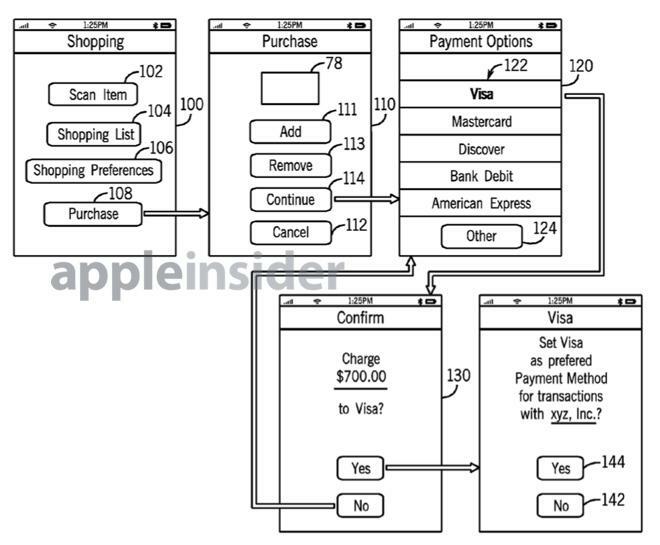 The application shows Apple's payment system driven by an iPhone with an included near-field communications chip. To date, no Apple hardware has included NFC functionality, as the company has instead opted to rely on Bluetooth for short-range wireless functions. The NFC functionality could even allow users to easily transfer money to one another using just their iPhones. In one example, two iPhones within range of one another are used to move funds from one person's account to the other's. The filing, published by the USPTO on Thursday, was first made by Apple in September of 2012, but is a continuation of filings dating back to September of 2008. The proposed invention is credited to Andrew Hodge, Michael Rosenblatt, Amir M. Mikhak, Gloria Lin, and Taido L. Nakajima.